Some folks got a kick out of referring to Karol Wojtyla as “Pope John Paul the Great”, as if a few journalistic designations could help to fix a historical understanding. What we’re beginning to see now are the various shapes of the long term effects of “Pope Bergoglio the Tenacious”. He knows he’s making significant changes, effectively undoing things that Pope Wojtlya put into place, and he is consciously acting in such ways as to assure that his mark will be felt far into the future. 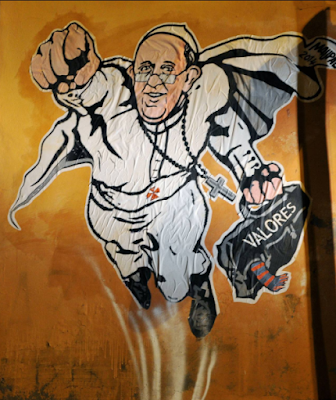 [“Pope Francis”] has no desire to go down in history as a “transitional” pope. That which he is doing, he wants it to survive his departure. And to make sure of this he is institutionalizing the things dearest to him, he is making them stable, with all the numbers to keep moving forward on their own. To that end, he is not only stacking the deck of Cardinals who can vote for a like-minded “successor”, but he is also coming up with new “traditions” that future popes will find difficult to stop. A collection of anti-capitalist and anti-globalization “popular movements.”, which “is another of his inventions. He has entrusted its selection to an Argentine trade unionist friend of his, Juan Grabois, who fishes each time from among the diehards of the historic anti-capitalist and anti-globalist assemblies of Seattle and Porto Alegre, with a side order of indigenous and environmental groups and with prominent guests like Bolivian president Evo Morales, in his capacity as a coca grower, or former president of Uruguay José ‘Pepe’ Mujica, with a past as a guerrilla, who has now retired to live a frugal life on a farm. To this gathering, Bergoglio gives fiery speeches every time of thirty pages and more, which are the quintessence of his general political vision, harnessing the people as a ‘mystical category’ called to redeem the world. There have been four convocations so far”. Thus, for Bergoglio, the Roman Catholic Church of the future will assume a profoundly secularist, even social-justice socialist flavor. Vatican II, inspired by Pope Paul VI and John, decided to look to the future with a modern spirit and to be open to modern culture. The Council Fathers knew that being open to modern culture meant religious ecumenism and dialogue with non-believers. But afterwards very little was done in that direction. I have the humility and ambition to want to do something [emphasis added]. … providence has placed me at the head of the Church and the Diocese of Peter. I will do what I can to fulfill the mandate that has been entrusted to me. I am the Bishop of Rome and Pope of the Catholic world. The first thing I decided was to appoint a group of eight cardinals to be my advisers. Not courtiers but wise people who share my own feelings. This is the beginning of a Church with an organization that is not just top-down but also horizontal. When Cardinal Martini talked about focusing on the councils and synods he knew how long and difficult it would be to go in that direction. Gently, but firmly and tenaciously. “The real reason why I cannot be in communion with you [Catholics] is not my disagreement with this or that Roman doctrine, but that to accept your Church means, not to accept a given body of doctrine, but to accept in advance any doctrine your Church hereafter produces. It is like being asked to agree not only to what a man has said but also to what he is going to say.” From “Christian Reunion”, in Christian Reunion and Other Essays, edited by Walter Hooper, London: Collins, 1990, p. 17-18. Pope Bergoglio the Tenacious is bringing that fear to life. "Thus, for Bergoglio, the Roman Catholic Church of the future will assume a profoundly secularist, even social-justice socialist flavor." DV it will go the way of the other Liberal churches; ie more ash and trash for the Kidron. It will depend on how long Bergoglio lives and how many of his cronies he can name as Cardinals I think.